On November 28, Russian air-defense forces deployed intercepted and destroyed an unmanned aerial vehicle (UAV) near the Russian Hmeimim airbase in the province of Lattakia, according to local sources. The intercepted UAV was probably an armed UAV launched by militants in a fresh attempt to attack Russian personnel and aircraft deployed at Hmeimim. The resumption of UAV attacks on Russian facilities in Syria is another sign of the wanng influence of the de-militarization agreement on Idlib province. It’s highly unlikely that radical militants are going to abandon their hostile approach anytime soon if a military operation to punish them is not launched. Cells of the Kurdish People’s Protection Units (YPG) continue their successful attacks on Turkey-led forces in the area of Afrin. On November 26, 4 members of the Hamza Division militant group were killed and 2 others were injured in an explosion of a YPG-planted IED on the road between the city of Afrin and the town of Basuta. On the same day near the village of Gubele, the YPG destroyed a vehicle of another militant group, the Levant Front with an anti-tank guided missile. Successful YPG operations in Afrin show a significant gap in the security system established by the Turkish Armed Forces and Turkish-backed militants in the area. 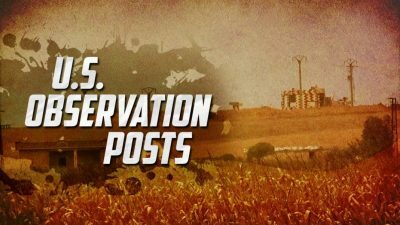 On November 28, the pro-opposition Syrian Observatory for Human Rights claimed that the US had started establishing the first of its observation posts along the Syrian-Turksih border. The first post is reportedly located near Bir Ashiq in northern Raqqah. With this move, which was announced by Secretary of Defense James Mattis last week, the US is in fact seeking to prevent a possible Turkish military operation against US-backed Kurdish factions in northern Syria.